Yes, we recommend you order a sample pack before placing an order as the nature of foil blocking is best appreciated in physical form. Can I change the wording on my chosen design? The wording on our wedding stationery designs is for illustration purposes only. You can supply whatever wording suits the nature of your wedding and we will format it to make sure that it looks right with the design that you have chosen. Can I use your invites for an Engagement Party, Birthday or Christening? All our invitation designs can be used for any event you like. And, since you choose the wording, it’s totally up to you how you invite people and what you invite them to. 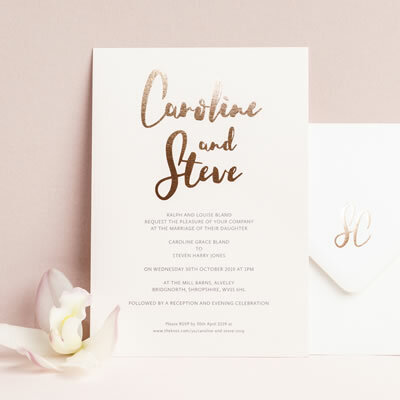 Can you print guest information on the reverse of my invitations? We don’t recommend it as often an indentation shows through from the foiling process. We also think it makes the invitation feel less special, so advise you include a separate, slightly smaller information card. How thick is your card? Our standard range of card for online orders is premium 300-350gsm. 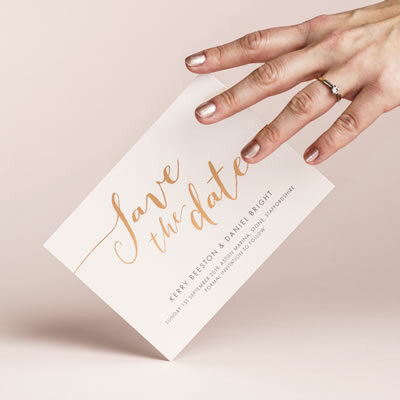 For an additional charge can choose to double your card thickness for your Save the Dates or Invitations to an extra heavyweight 600-700gsm. Do you offer any other card or foil colours? Yes, we offer a wide range of alternatives, please contact us and let us know what you’re looking for. We advise you order an extra 10–20% to allow for addressing errors or last-minute guest list changes. Reprints are costly due to the manual steps required to process each order, so it is always considerably cheaper to order a few extra up front, rather than reprint more cards later. For all items ordered online, unless otherwise stated, our minimum order is 20. The option to purchase envelopes in a range of colours is available with every Invitation, RSVP Card, Save the Date or Thank You Card order. Our envelopes are gummed with a diamond flap. You can cancel your order and obtain a full refund at any time before we’ve generated your digital proof. From this point until you sign off the design you can cancel your order and obtain a refund minus a charge for design of the digital proof (cost dependent on order). Once you have approved the proof no refunds can be given unless there is an error on our part. Please view our terms and conditions for full details. 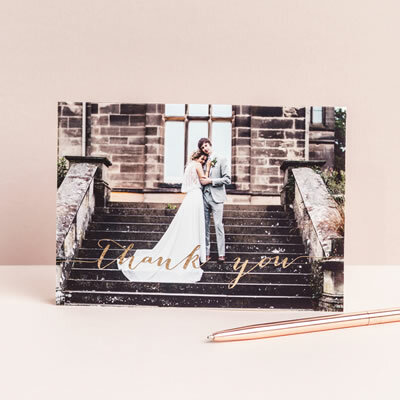 The Foil Invite Company are fully committed to providing the highest quality products, therefore if you are unhappy with your stationery, please contact us straight away. In the event of an error on our part, we will do everything possible to resolve the problem and complete your order correctly. Due to the custom nature of our products we are unable to offer a refund or replacement if the error is on the approved proof. It is important to remember foil blocking is an artisan craft and slight variations and irregularities are to be expected. This is part of what makes foil blocking so special.